Today (or rather yesterday, I should say!) , I treated myself to some inspiration from the outside world, away from my thesis. The events I had chose for this occasion were a talk on ‘Aquatecture’ and the ‘Radical Nature’ exhibition, both at the Barbican. Both events offered very interesting takes on ‘substances’. At the center of many of the works was architecture and its perception as clunky and inert. By showing that architecture could be nomadic, invisible, boundary-defying – or that invisble things have, in fact, substance, too, this notion was challenged. In the ‘Aquatecture’ talk, for instance, architect Frank Gutzeit talked about a way of building structures in the ocean out of something called ‘biorock’. Biorock uses electricity to make limestone grow on steel structures which then attracts reefless corals and other flora and fauna. So rather than dumping a ready-made rock into the water and fearing its erosion, the alternative process makes use of the composition and other properties of sea water in order to generate material from it rather than losing material to it. The Open_Sailing project introduced the idea of a nomadic, self-sustaining international ocean station. Their fascinating project summary can be found here. (Somewhere there is some punctuation missing I feel…) Waves possess architectual form, the materiality of air is used by organisms such as viruses. Rahm seems to work on this theme in several other works, for instance, Paradise Now! which creates spaces through smell. Molly Wright Steenson has written an interesting post on her blog on Rahm’s ‘invisible environment’ and the ‘new geography’ he envisions. I’d like to look into this a little more in the future! 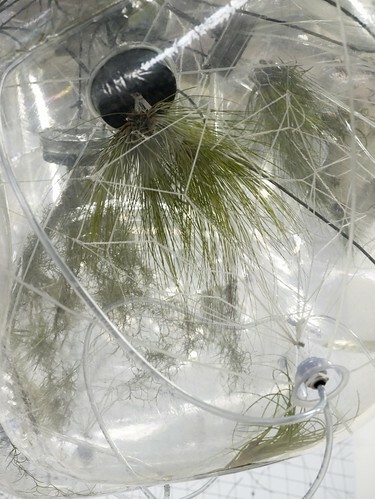 Tomás Saraceno had devised another air-inspired concept, that of the ‘flying garden’ – part of his ‘Air-Port-City’ series. Again, a nomadic structure, this time its structure and inhabitants designed to be ‘air-sufficient’. Whereas Buckminster Fuller’s design focused on the perfection of the triangle, Saraceno has formed an almost spiritual bond with the ‘bubble’. A more in-depth explanation of the project can be downloaded here (PDF). As for the contributors I had heard of, one continues to draw me in, and that is Joseph Beuys. Unfortunately, I did not have the time to watch the 57 minute (!) film that was running in the space dedicated to his work as it was near closing time. I caught a few bits which, strangely, also related to chaos. In Beuys case, chaos was embodies in materials such as grease which is transmuting between a definite and an indefinite state. Grease, wax and honey played a central role in Beuys’ work as ‘energy storers’. What inspires me most about him is his thoughts about process and thinking. As an example, for Beuys, food turns into energy which fuels out thinking. Or: the physical and thought processes that lead to an artwork are the actual artwork, rather than the resulting object. Beuys elevates the creativity of thinking, speaking and writing to the status of art. In fact, ‘everything that people place out there… should exist in the world as a question looking to be augmented, improved, enhanced’ (Beuys in ‘What is Art?’). His ideas about human-evironment relationships are equally interesting, after which our thinking and our conversations are part of ecology, but this connection is invisible to us unless we train ourselves to see it. Interestingly, the eye-opener to this relation, for him, was working with materials and learning about material processes. Last but not least, I would like to include a video of the famous ‘Blur Building’ by Diller and Scofidio, which is often used as an example of an architectural work that questions the nature of space and spatial boundaries. And it does this in the form of a habitable cloud! If you like to see more ‘geographical challenges’ such as Agnes Denes’ amazing Wheatfield project, visit the ‘Radical Nature’ exhibition at the London Barbican (until 18 October). Unfortunately, there is not much of the exhibition online. However, they have started to put a few videos up which you can also watch via youtube.